Next thing I knew, I was driving on the First Bunker Road, past some orange groves that my dad used to tend, past Oak Hill, toward Limestone. (Don't bother, you may not find all of these names on the map.) I saw the sign for "Solomon's Castle" and made the spontaneous decision that I would pay a visit. 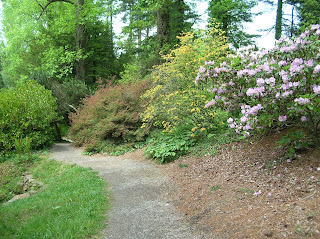 On toward Lily, and then the drive toward the castle. Though I'd heard of this attraction for years, I'd never been there. I believe that Howard Solomon first began building his remote Florida paradise in 1972, after I'd already left Arcadia for college. On subsequent visits home, and even during a brief period after college graduation when I returned to Arcadia to teach, there always seemed to be something more pressing than going out to visit what I'd assumed to be just another tacky tourist trap. This day, I hadn't passed another car on the road for several miles (only great trucks hauling late-season oranges and watermelons) so I was very surprised to find a dozen or so cars in the parking lot for the castle. The tour of the "castle" is but a small part of the experience. If you're hungry, you can get a really delicious home-made meal or scrumptious dessert in the "Boat in the Moat." There's shopping, of course, for both Howard's works as well as some carefully selected items that echo a nature theme. I chose to wander one of the trails leading down to Horse Creek, and marveled at how long it'd been since I'd felt good ol' Florida scrub sand between my toes. Heck, with advance reservations, you can spend the night in the castle, or in the luxurious B&B that's on the grounds! I'm not sure this event qualifies as "serendipitous." Perhaps it lacks the connection to divine providence that a strict definition of serendipity requires. However, the experience refreshed me, and reinforced for me the notion that there are treasures all around, sometimes hidden under our noses, sometimes (as in my case) for years ... and maybe it takes a little inconvenience or some similarly not-altogether-pleasant thing to nudge us in their direction. Yes, I'm disappointed that our van is still, as of this writing, waiting for the mechanic, and no one seems to know just when it'll be set right. (Maggie, by the way, is right as rain!) But it turned out to be a fun day, an enlightening experience ... and quite an inspiration. 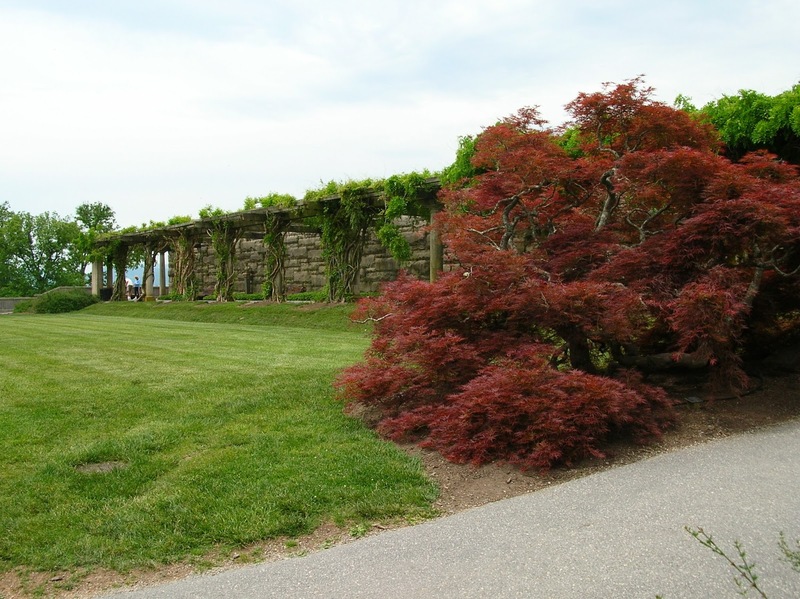 We are now staying in what we consider our home away from home: Swannanoa, North Carolina. Endured a terrific wind storm on our first night, but since then, it's been pretty tranquil. We do love it here. 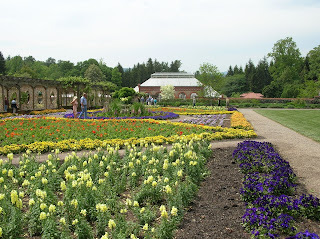 Today, Maggie Muggins (our dog) and I went to the Biltmore Estate, which is currently celebrating its Festival Of Flowers. The two of us gals had previously visited the Estate's Riverbend Farm back in July, so we concentrated our sightseeing on the gardens adjacent to Biltmore House. 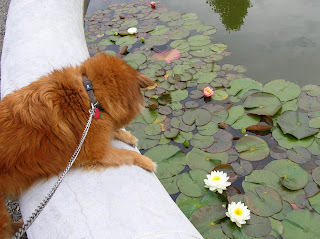 The photo is one of The Mags examining water lilies in the Italian Garden. Visiting gardens with a dog is probably as much fun as visiting a circus with a child -- minus the excited chatter! Maggie wanted to explore every path, sniff every tree, delight in wading through the ivy that covered the ground. 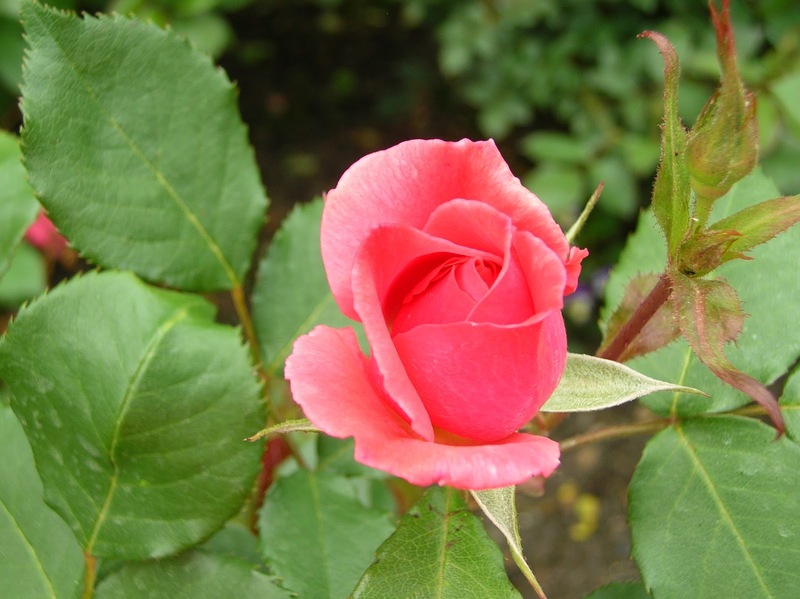 Her senses must have been overwhelmed, especially with the scents of jasmine, honeysuckle and rose that perfumed the air. 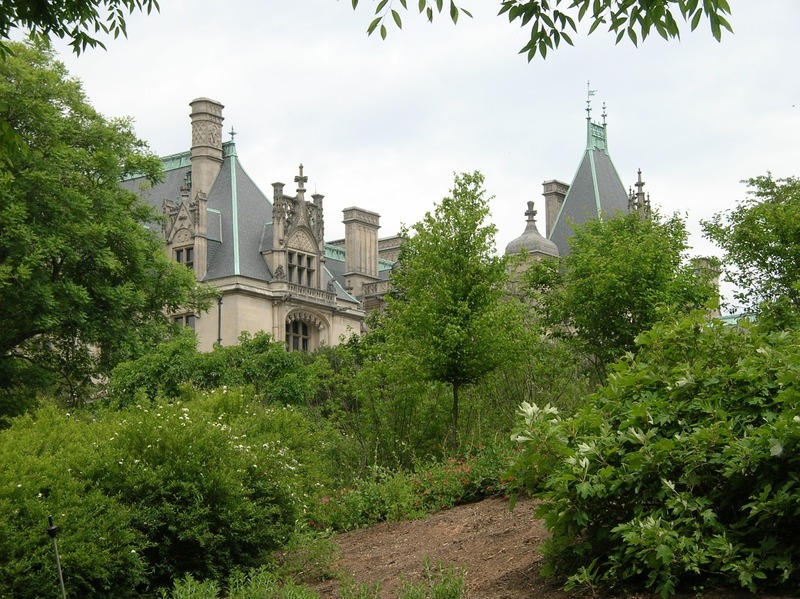 I wonder how many people visit the grand Biltmore House without ever venturing into its gardens? The house, its furnishings, its priceless works of art are indeed a wonder to behold and not to be missed. But inside the house, one must keep moving along with the long line of visitors; there's no place to stop and take time to process the experience. There are several Flemish tapestries, for example, that have all sorts of Biblical or classical imagery woven into them, and I've often wished that I could pull up a chair with a friend and take time to identify every scene or event depicted in those tapestries. Impossible! 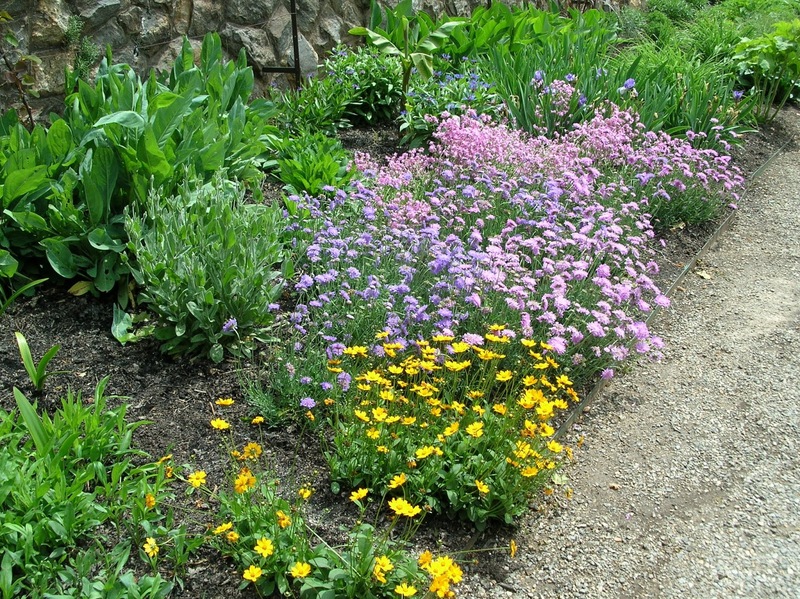 It's all different in a garden. 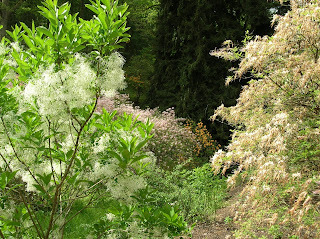 There's plenty of time for contemplation, for study ... for simple enjoyment of nature. Take a look at the first picture above. 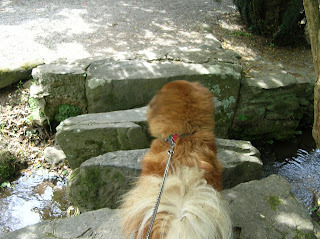 Maggie had to choose to cross stepping stones over a rushing stream in order to continue on our path. Pretty scary stuff for a dog! She hesitated at first (so did I) but figured out how to get across, because she wanted to experience everything. Instinctively, I suppose, she knew that there were great rewards beyond that obstacle. If she were able to talk, she'd probably tell you that her instincts were right! 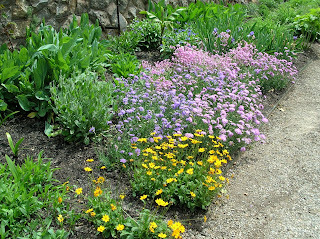 It reminds me of a quote that my grandmother had in her house: "You're nearer God's heart in a garden, Than anywhere else on earth." 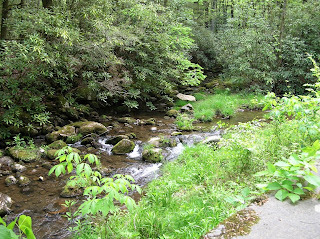 Greg and I have made little day trips into the Great Smoky Mountains National Park. Maggie has gone too, and yesterday's visit was along the Gatlinburg Trail, which is one of few Park trails that dogs are permitted on. Today we got up really early and went into Cades Cove to view wildlife, and were rewarded with sightings of wild turkey, groundhog, deer, and even one bear. We were absolutely blown away by how calm the animals were, as if they know they have a safe haven inside the park. The Great Smoky Mountains had human inhabitants for many, many centuries. First, of course, were the Cherokee, who camped and hunted there. In the early 1800's, Scots-Irish settlers came to farm, raise livestock, and log. 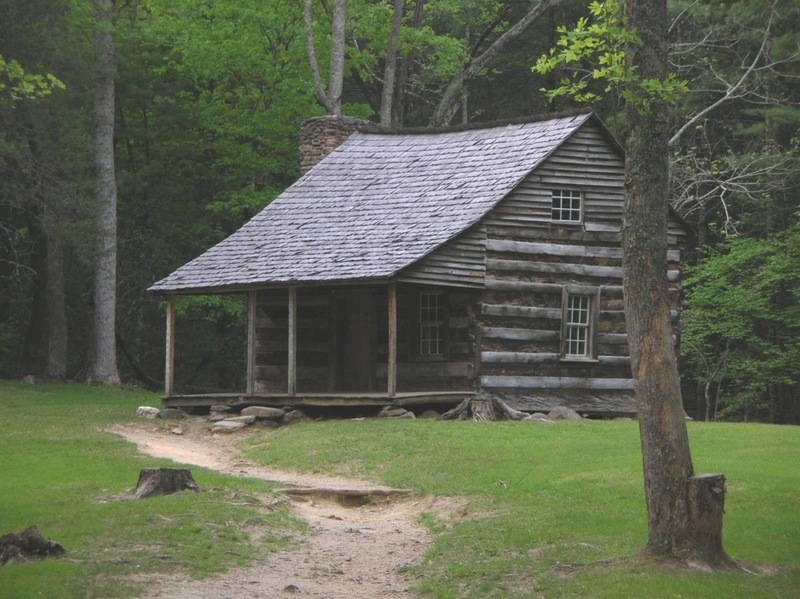 In 1927, the states of Tennessee and North Carolina began buying tracts of land which they would eventually give to the federal government for the establishment of a national park in 1933. This must've been quite a hardship on families who'd lived in the Smokies for generations, and a few resisted the forcible sale of their land, though ultimately they lost their battles against the government. 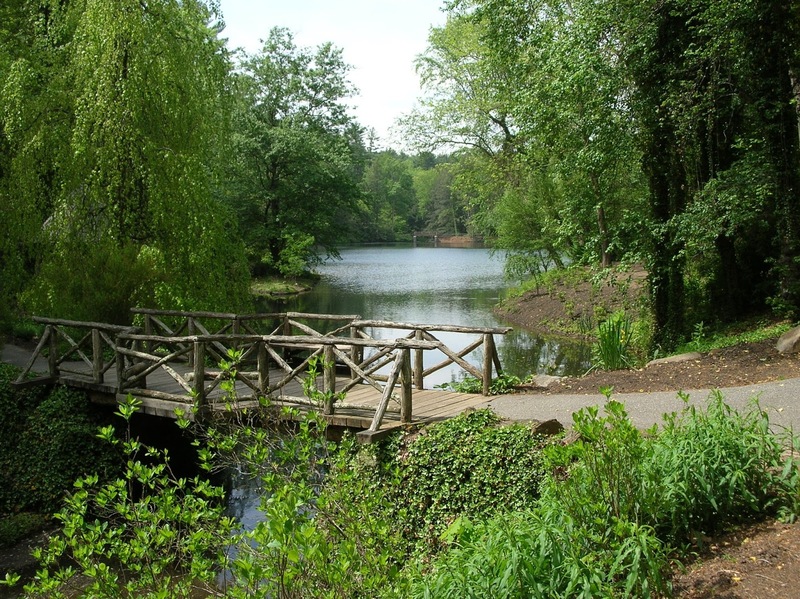 Residents who agreed to accept a little less money for their land were permitted to remain on it until their deaths, but their descendants could not inherit. The Great Smoky Mountains is the only park in the National Park system which was created from privately owned land. 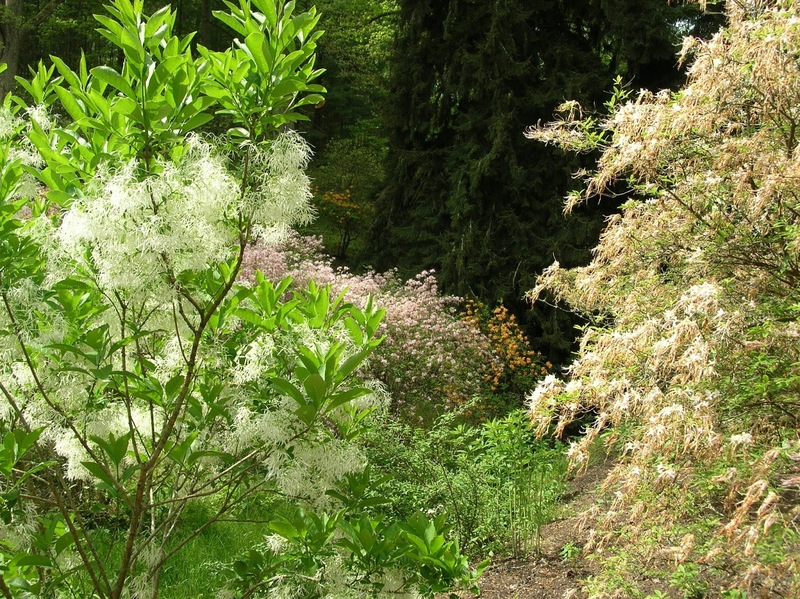 Lumber companies had owned more than 85% of the park, and had logged vast portions of it. Though I can certainly empathize with the hardy souls who'd carved out their daily existence in those mountains, their sacrifice, forced though it may have been, was a boon to us all, and particularly to the wildlife. 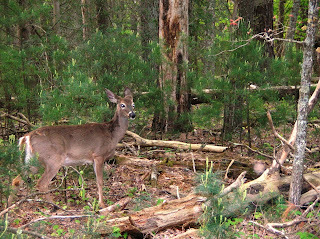 When white settlers first came to the Smokies, deer and bear were described as "plentiful." By the time the National Park was created, only an estimated 30 deer lived in the park. Otter, once hunted for their pelts, were no longer to be found in the mountains by the 1920s; elk had disappeared from the landscape in the mid-1800s due to overhunting and loss of habitat. 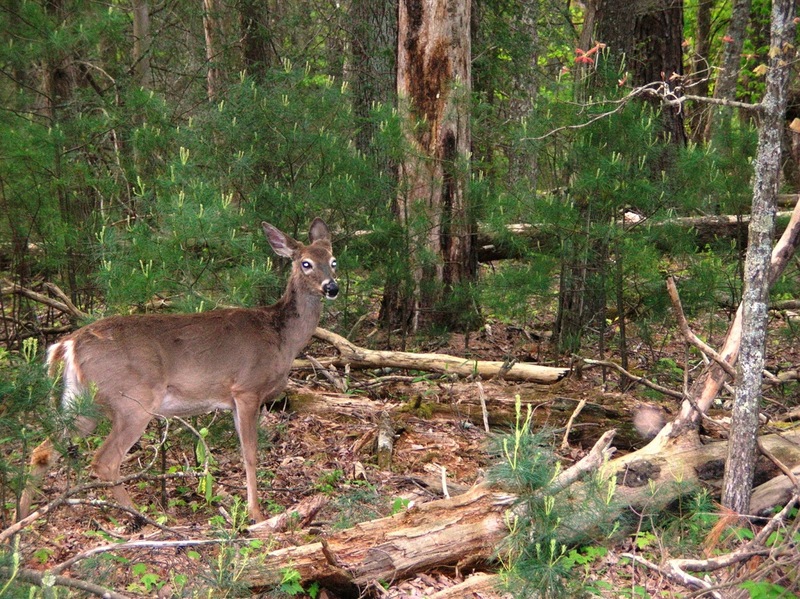 The deer population is now at an ecologically sustainable level, and both otter and elk have been reintroduced. About 1500 bears live in the park, and the park now boasts the greatest biological diversity of any area in the world's temperate zone. After leaving Cades Cove, we slipped into Townsend, Tennessee, to pay a visit to the Wood-N-Strings Dulcimer Shop. Now we're back at our campsite in Pigeon Forge, listening to thunder in the distance and enjoying a cooling afternoon rain. 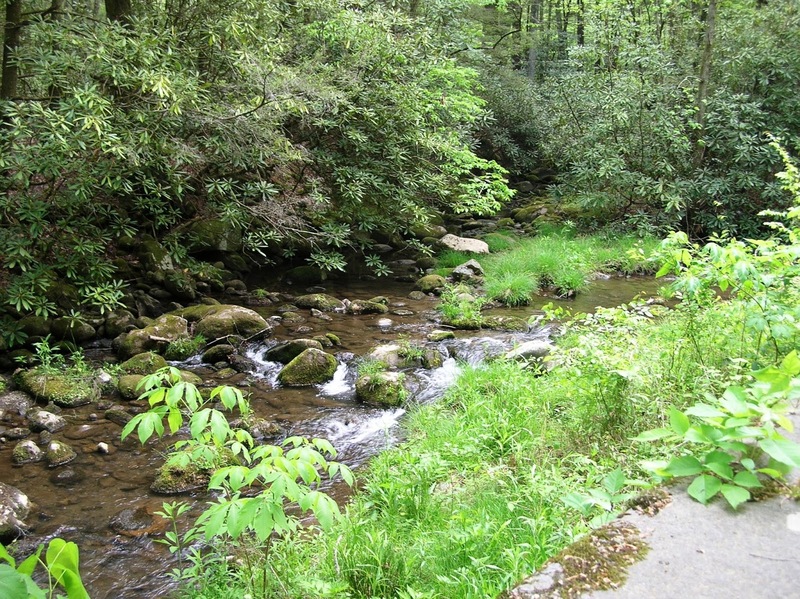 This photo was taken along the Gatlinburg Trail, near the Sugarlands Visitor Center. It's an easy trail -- the first half-mile or so is paved -- a perfect warm-up for future visits into the park! 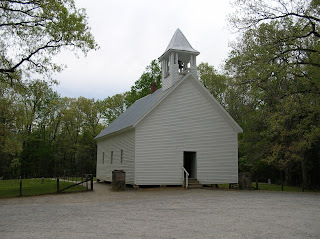 The Primitive Baptist Church in Cades Cove -- the church was founded in 1827, and this building was built in 1887. To the left is a cemetery. One of the stones bears this epitaph: "_____ murdered by North Carolina Rebels." This congregation were Union sympathizers and had to suspend services because of harassment from Rebels. 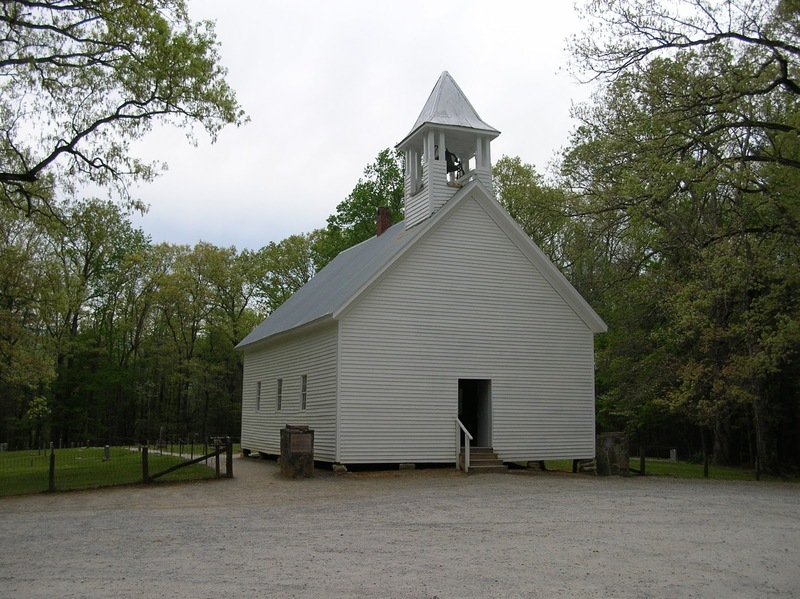 From an official church correspondence: "We the Primitive Baptist Church in Blount County in Cades Cove, do show the public why we have not kept up our church meeting. 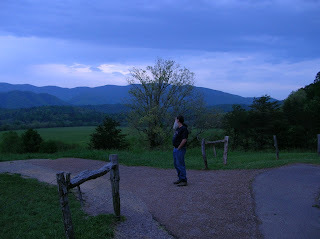 It was on account of the Rebellion and we was Union people and the Rebels was too strong here in Cades Cove. 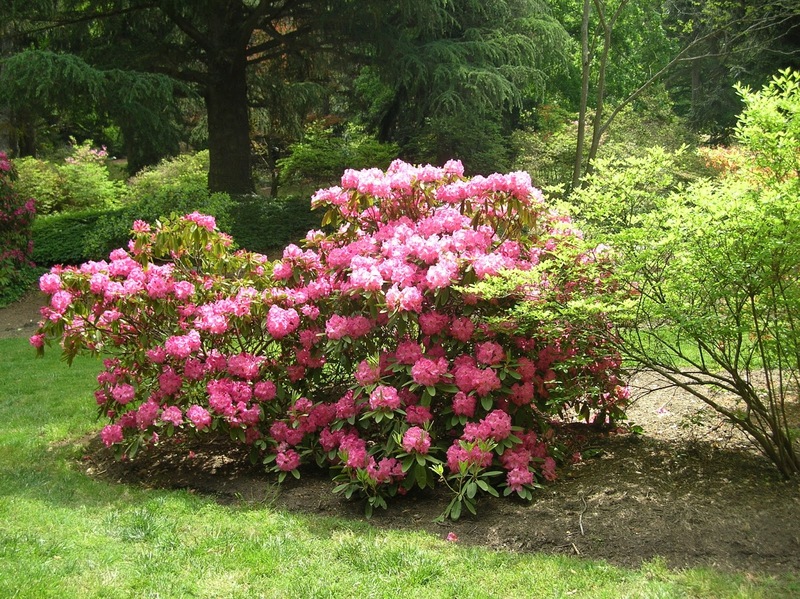 Our preacher was obliged to leave sometimes, and thank God we once more can meet." 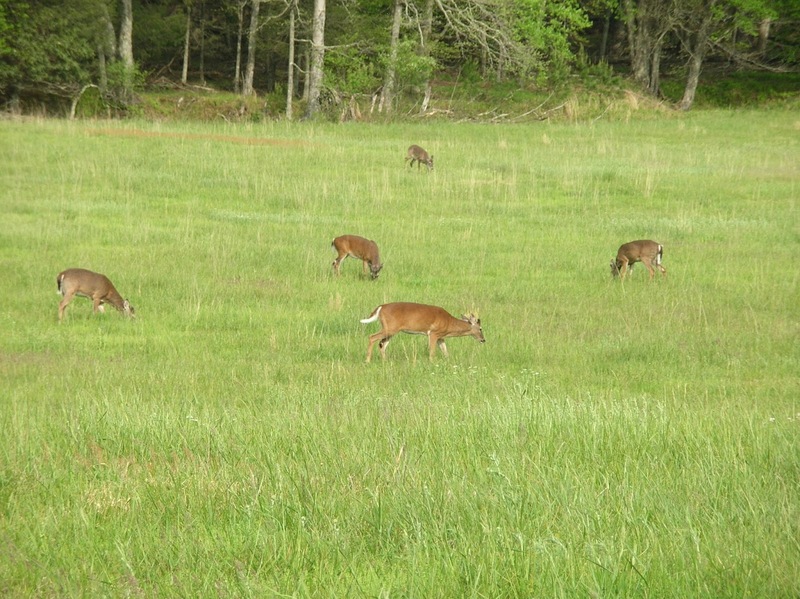 These deer couldn't have cared less that we were about 60 yards away. They are used to visitors, and know quite well that they own the place! Yes, that really is a bear in the center of this photo. Yes, that's about the best shot I could capture of it. 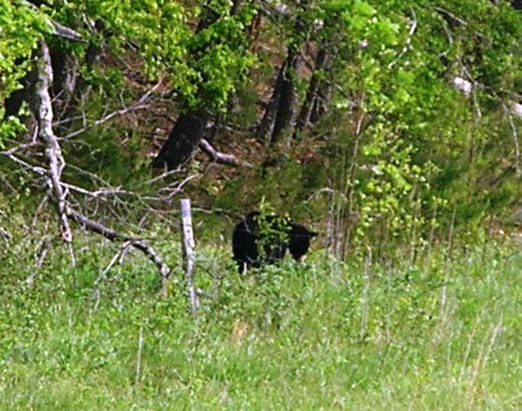 About 1500 bears live in the park, but for the most part they manage to elude visitors.